To adjust the APT settings after creating an APT Process, you you need to make sure you have selected the correct APT Process before you open its APT Control Panel. Press P key to open the Control Panel as shown right. You can repeatedly try other Presets or modify the parameters in the Control Panel and listening to the result. The APT Control Panel can remain open and, while signals are playing, you can adjust controls and the process will be applied. Presets (shown top right with "Factory Defaults") allows you to select Factory or your own previously saved "User" settings, and to save your own User Preset settings. There is also a Compare function to compare saved versions of a Process, and a Pinning control to keep this Process Control Panel open (while opening other Control Panels). For APT Processes there is a Process Lock button (shown locked red in the picture below) below the Compare and Presets section. This fulfils the same function as the lock button on the Process Control Track, and will stop further automatic processing from taking place. This is to stop any optional manual edits from being overwritten. Each of the controls shown has a "pop-up" explanation which will appear shortly after hovering the mouse pointer over a slider control or parameter display box. Further details of controls and what you might be able to do with them are given in the table below. If Lock icon OFF, all processing below is available. If Lock icon ON (Red), turns all further automated processing off. 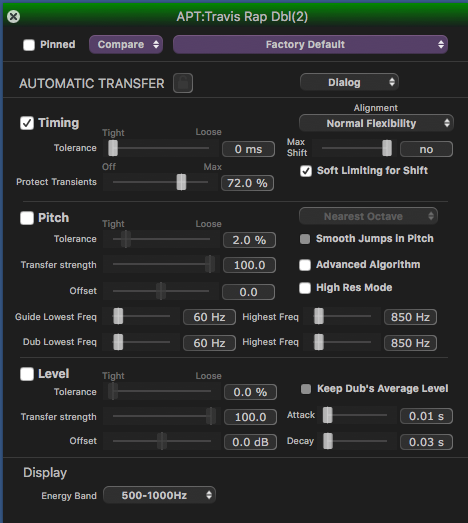 Dialog = If Pitch switch is on, Guide pitch is used exactly as the basis for the new Dub pitch - but the amount of modifications will be controlled by the settings displayed in the Pitch settings section - detailed below. Music = If Pitch switch is on, the Guide and Dub pitch traces are separated into long term average variations (e.g. over a note's duration) and short term variations (e.g. musical features such as vibrato). The amount of modifications will be controlled by the settings displayed in the Pitch settings section- detailed below. ON = Transfer Guide's timing to Dub automatically but obeying the Tolerance and Alignment settings. Alignment is least flexible, creates fewest edits. Sound quality may be best. Alignment is not very flexible, creates fewer edits. Sound quality may be better. best in most cases, balancing good alignment with moderate editing. Tries to match the Guide by time compressing the aligned audio as much as possible. If energy pattern does not change but pitch in Guide and Dub change together, this can work in signals with legato pitch changes. Max Shift - Reducing values restricts the maximum time shift from its original position allowed for the Dub audio. Guide pitch used directly as first basis for pitch modifications of the Dub. Tuning - Match long term average variation of Dub to Guide's. 100% - Apply Guide longer term average tuning to Dub. Fit - short term variations of Dub to Guide's (e.g. vibrato) from 0% (not at all) to 100% exact match. ON = Transfer Guide signal level to Dub (time-aligned). Offset – add a constant gain to the Dub level trace. Energy Band: Display the selected octave-wide frequency band used for energy measurements that are input to the alignment algorithm.